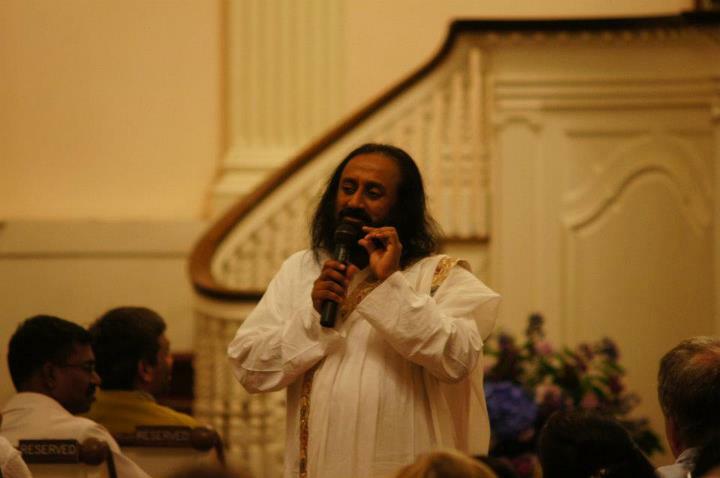 Q: Guruji, I am sincerely doing all these practices, but I am not sure that I have changed. I still see myself getting upset and that makes me unhappy. Sri Sri Ravi Shankar: Listen, how are you now? Are you happy now? Forget about the past. Are you happy to be here? Are you enjoying? That is it. Inside each of us there are two things. There is one thing that does not change. There is a constant flow of a consciousness that doesnt change. Many other things around that keep changing. So, when you look back in your life, you are not the same person that you were. But at the same time, when you see, you are the same person. Both are there simultaneously. When do you feel that you have not changed? When you get upset. Suppose somebody pushes a button, and you get angry, you say, Oh, I have not changed, I still get angry. That is the problem, right? That is not true. In the past, you got angry, but the anger stayed in your mind for months and months. You get angry even now, but it just stays for a few minutes, or till you do one short Kriya, and then you become fresh again. Q: Guruji, I only want to do seva, sadhana and remain in knowledge. But right now, my mind is going in all other directions, being attracted towards guys and all that. I don’t want to be in that position. I want my mind to be with you. What do I do? Sri Sri Ravi Shankar: You want to get married? Yes good! Go ahead and find the right guy and get married. Put your name in the Art of Living matrimonial. They will find some suitable person, or you find yourself. Q: Guruji, How do we find our lifes mission? Sri Sri Ravi Shankar: To realize ones mission, your mind has to become clear. And doing Hollow and Empty meditation makes the mind very clear. When the mind is clear then intuition comes up. Think how best I can be of use to people, and when you become useful to people around you, when your life is for seva, then you find that life is very meaningful and very fulfilling. If your life is only centered on yourself, What about me, what will I get? How much more joyful can I be? If you are focused only on that then you go into depression. See, your strength and talents are meant to be put to good use for others. If nature has given you a good voice, is it for you or for others? Do you sing and listen to your own song? If nature has given you a good voice, that is for others to enjoy. So, any strength that you have is not for you; it is for others. Any power or strength that you have can be used in two ways. Either you use the power to fight with others, or use the power to serve others. For centuries, people in the world have been gaining power only to fight with others, isnt it? One gained power so that they could fight another, and whom do you fight with with the one who is equal to you. Definitely one does not fight with someone who has less power than them. One fights with someone who is on par with them. And nobody has found happiness in fighting with power. If the power that you have been given is put to good use, to serve, it brings you satisfaction and happiness. So, everything that you have power, beauty, money, appearance, voice, they are all meant to be put to good use, for the service of others. Then, you find life will be so fulfilling. Q: Guruji, some pictures have been taken of people during meditation and it has been found that white patches come on the skin. Many times it is said that these are reflective dust particles. Sri Sri Ravi Shankar: That is ok. While doing meditation, all angels and gods are there around us. Q: Guruji, what is the essence of life? 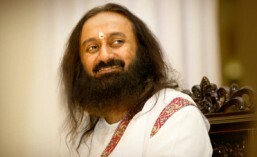 Sri Sri Ravi Shankar: Oh, you want to know the essence of life? Very good! Just keep coming and sitting here. It will reveal itself one day. Q: Guruji, Where is the end to greed? Sri Sri Ravi Shankar: In the burial ground; you cant be greedy there. It is unfortunate that greed has overtaken our society and the world in fact. Do not think corruption is only India specific. Wherever I go it is the same thing, corruption in Bulgaria, corruption in Russia, corruption in Ukraine; every country is suffering from corruption. In Greece there is a tremendous amount of corruption, the country has drowned because of corruption. In many countries corruption is a problem, not just in one country. Q: Guruji, Do we create our reality or is everything predetermined? See, when you go to the park, you go with a leash on the dog. That is legal. Now, the dog has freedom only for the length of the leash. Correct? It can sit very close to where the leash is, or go as long as the leash is. That much is its freedom. If you have trained a dog to be in one area, that is his freedom. He doesnt go twenty kilometers away. Similarly, in life, everybody has some freedom, and some things are fixed. Human beings have this freedom because humans have intelligence. The lives of animals are programmed. They never overeat. Their life is aligned with nature, but we have the freedom to align with nature or violate the law. Are you getting what I am saying? When you align with nature, there is harmony, and when you go against the laws of nature, there is disharmony. So, in life, many things are fixed and a few things are free will. I will give you another example. When it is raining to get wet or not is your freewill. You can take an umbrella or a rain coat and not get wet. So, life is a combination of freewill and destiny. The more you go deep into meditation, the happier you are, the more you align yourself with nature, the more you will have free-will. Q: A few people also suggested that we can initially agree to pay the bribe but put a condition that we will give it after the job is done. Once the job is done, we can say that we will not pay you anything now. Can we follow this suggestion? Sri Sri Ravi Shankar: Yes, you could use such tactics too! Q: Guruji, if you wish to do business, and if you are told that your horoscope is not supporting that, but you believe in yourself, what to do?